You’ve heard of Frank Oz. He’s the voice of Yoda, Miss Piggy, Fozzie Bear, Grover – virtually every truly interesting American puppet voice you’ve grown to love. He’s also the director of such imaginative films as Bowfinger, Little Shop of Horrors, Dirty Rotten Scoundrels, and Dark Crystal. Marlon Brando refused to work with Frank Oz (he kept calling him "Miss Piggy"). Robert De Niro had to direct all of the scenes that Brando was in, while Oz watched on a monitor in another room. That’s what it’s so amazing about The Score – you’ve got this talented creative mind directing a multi-generational who’s who of American film (Brando, De Niro, Norton, Bassett), and it still amounts to nothing more than an entertaining action flick with a level of intelligence a step above, say, The Rock. It’s not that this isn’t an enjoyable film. While the tale is pretty straight-forward (accomplished thief looking to finish up career faces one last really tough “score”) and the acting is predictably good. 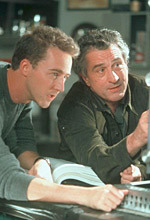 Edward Norton, who rarely makes anything less than stellar, puts in a command performance as the cocky kid working with a seasoned De Niro. His faux-retarded act is convincing and funny. De Niro isn’t exactly stretching himself as the intelligent, classy criminal who rarely sweats but always succeeds. Brando makes some short, reasonable cameos as the painfully fat ring-leader, and Angela Bassett is an enjoyable presence in her limited role as Bobby D’s girl. Even the action is compelling. They jump through some pretty damn complicated hoops to reach their “score”. There’s enough twists, turns, and technology to keep it interesting for the majority of audiences. This is the type of film that, were I a certain kind of critic, I would deem an “edge of your seat, thrill-ride of the summer”. But I’m not. While The Score is a decent way to spend $7.50 on a summer afternoon, it isn’t nearly the film that it could have been. With such a talented cast, Oz and crew could have done far more.